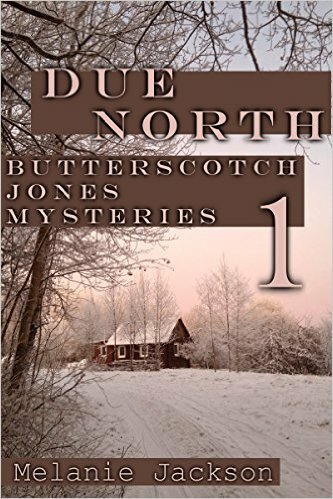 Why am I writing about Due North, an adult mystery by Melanie Jackson? Three reasons, people. It's self-published, as is the eBook edition of Saving the Planet & Stuff, which I am featuring here this month. (See how I just managed to mention Saving the Planet again?) From time to time, I try reading a self-pubbed book, in an attempt to provide a little support for authors doing what I've done myself. Due North is the best self-published book I've read to date. And, finally, it's an excellent example of the importance of world-building in a realistic, nonfantasy/scifi story. Due North is set in the remote Canadian town of McIntyre's Gulch. We're talking remote in a not- everybody-has-a-phone-or-even-a-radio-connection-to-the-outside-world remote. In a you-might-not- see-your-neighbors-for-a-few-days-during-a-snowstorm remote. In a there-are-only-two-church- services-a-month-when-a-person-of-the-cloth-comes-by remote. The red-headed residents of McIntyre's Gulch come in two varieties--McIntyres, who are related to one another, and "self-selected Joneses...transplants from the outside: refugees, outcasts, and sometimes actual outlaws." The McIntyres come by their red hair naturally. Some of the Joneses "owe a debt to L'Oreal and Clairol." Which I assume they must have to have flown in. I can't recall why the outsiders choose to go red, unless they're trying to blend in with the natives and thus not draw attention to themselves.Which they all have reasons to want to do. This is a rough crowd choosing to live in a rough climate, because they need to get away from it all. A disturbance comes their very well-drawn world when a plane falls out of the sky. It's not so much the plane that's disturbing as what's in it. The McIntyres and the Joneses respond about the way you'd expect them to. And the owner of the plane's contents responds about the way you'd expect him to. I have to say, it is often a chore to read self-published books, something I do to try to make myself feel as if I'm doing good. That was not the case with Due North at all. It was an enjoyable read. I can understand, though, why traditional publishers would have a problem with a book like this. It's described as being part of the Butterscotch Jones Mystery Series, though it's not really all that mysterious. It's also described as representing "a new genre of cozy thrillers." I don't know if thriller readers are looking for cozy. This book and its sequels are on the short side, too. In its paperback edition, Due North is only 123 pages. Some of the other books are even shorter. Maybe it would be better to call this a short, eccentric, caper story. My point being that traditional publishers would probably have a problem fitting this book into a marketing niche. They wouldn't know how to sell it. Publishers are in the business of selling books. If they don't know how to sell one, it logically follows that they wouldn't see much point in publishing it. When self-publishing works well, with good writing, editing, and production, it may be able to provide a home for books like Due North. I'm talking books that are square pegs that won't fit into round holes and can't be sold with a tried-and-true marketing plan that everyone's comfortable with. In this best of all possible self-publishing scenarios, the reading public would be offered more options, options they can't find in traditional publishing. You'd need a self-pub reading market that knows these kind of quirky books exist, of course, and how to find them. I believe I stumbled upon Due North in my Twitter feed. Someone tweeted that the eBook was only 99 cents, so I took a chance on it. It was worth the gamble.